Chakra Energy Work involves balancing your chakra’s & aura to create manifestation & change alignment with your highest potential, the strongest & most powerful pathway for you. Your Chakra Energy Session will be 1.5 hours. During: a Chakra Balancing Session we begin releasing & transmuting your blockages, & tuning your Chakras for balance, this brings you back into your natural aligned energy flow. We work with your 11 Chakras, & minor Chakras, ARCM’s (auto response control mechanisms) & Cording etc. Keeping it simple, this means your Chakra(s) are spinning too slow, too fast or not at all for various reasons. After: In most cases, you will feel balanced, light & you will notice during the following weeks that synchronicity may begin to occur. You will receive audio support for your own self care & empowerment. 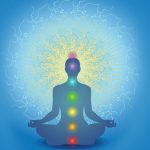 Chakra work is completed within Quantum Kinesiology Session. Please schedule the rest of your day so that after the session you won’t have activities that will require a lot of concentration or physical hard work. Please don’t schedule work appointments or to fly out right after the session, as we may run late. We also suggest a follow-up appointment for further support after approx 4-6 weeks, &/or meridian correction, this is dependant upon original issue worked on, some may require 3 sessions closer together at first.